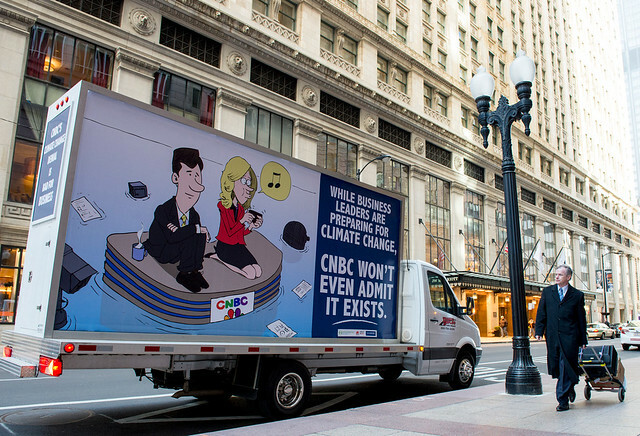 As part of a campaign to pressure CNBC to improve its climate change coverage, mobile billboards  are circulating the financial districts of New York City and Chicago on Thursday and Friday. However, rather than airing accurate information on how prominent business leaders use climate science to optimize their risk management strategies, CNBC has continued to air people denying climate change entirely. The campaign by Media Matters, Forecast the Facts, and Environmental Action was hosted on fuel-efficient trucks to highlight Media Matters' studies  finding that the majority of CNBC's relevant coverage casts doubt on the basic scientific consensus that climate change is real and manmade. So far, CNBC has not shown any signs of improvement -- even after  a 45,000-signature petition  called on CNBC to improve its coverage. CNBC host Joe Kernen also rebuked  a utility CEO for his efforts to protect consumers from for climate-related impacts earlier this month. Kernen suggested, contrary to preeminent insurance companies , that it is "not necessary" to prepare for the increases in certain weather extremes.